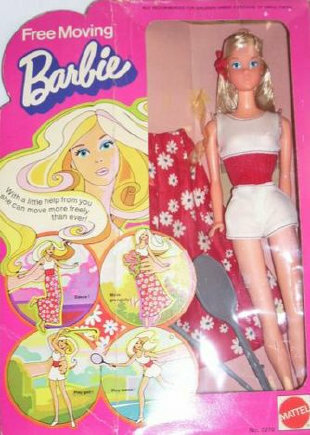 #7270 Free Moving Barbie was an active doll! She had a mechanism on her upper back that could be pulled out. When it was pulled, she would become moveable and her waist could twist, and her arms could swing her golf club and tennis racket. There was also #7281 Free Moving P.J., #7283 Free Moving Cara, #7282 Free Moving Curtis and #7280 Free Moving Ken. They are marked: Free Moving Barbie, P.J. & Cara: © 1967 Mattel, Inc. Taiwan U.S. Pat. Pend. and Free Moving Ken & Curtis Marked: © 1968 Mattel, Inc. Taiwan U.S. Pat. Pend.